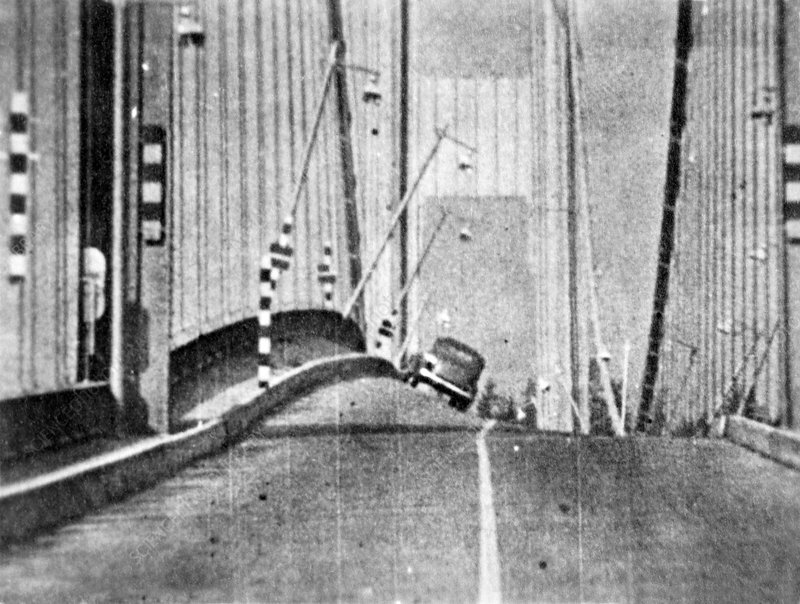 Tacoma Narrows Bridge collapse. This road suspension bridge spanned 1810 metres across the Tacoma Narrows strait in Puget Sound, in the US state of Washington. It opened on 1 July 1940, but collapsed on 7 November 1940 due to oscillations caused by aeroelastic flutter in gale-force winds. The wind produced both vertical and torsional motion. This view, from the east, is part of footage (see images C013/1938-1941) filmed by US engineer Frederick Bert Farquharson (1895-1970). Farquharson attempted but failed to save a dog trapped in the car. The images form part of the Historic American Engineering Record.